Welcome to our short report for the Munich show 2017.
ahead of the show, having had a very early start from Heathrow. The stock and showcases were already at the venue having been prepared and loaded into the truck a few days prior. Inside the hall we get the first glimps of the Crystal Classics Booth. As the exhibitors arrive space becomes more and more a valuable commodity. This gives an idea of the space at the Munich show - and this is just one of the four exhibition halls. and minerals into the show room in preparation for the setup. 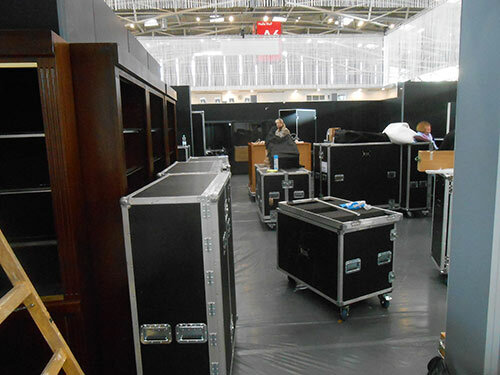 The Crystal Classics booth as the flight cases arrive and the first of the showcases are put into Place. The main entrance corridor into hall A6. Debbie with Diana fitting the LED lighting to the showcases. Some of the Crystal Classics team. L to R - Dave, Debbie, Pavel and Martin. Ian and Diana with Bryan Lees of Collectors Edge Minerals. Part of the booth at the end of two days of preparation on site. 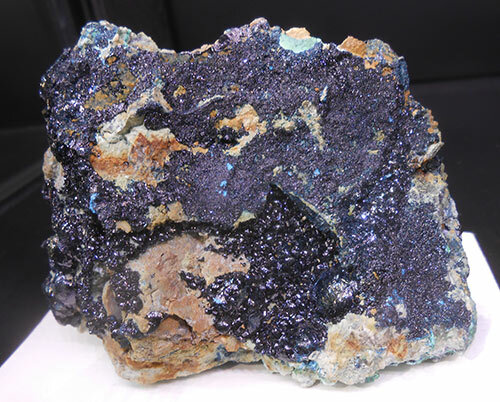 We are now ready to show all the great new minerals we have to offer. Here are some of the pieces on offer from the Crystal Classics booth this year in Munich. 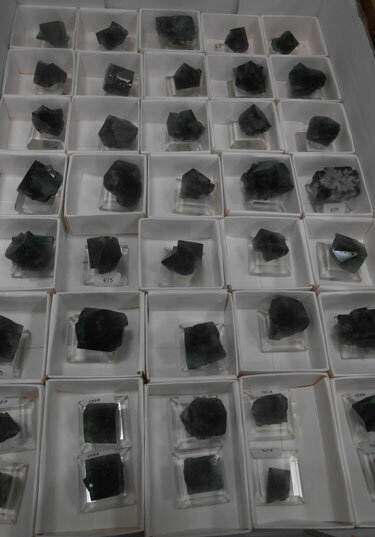 and from the relatively new find of fluorites from Ireland. A fine example of the Fluorite from Larkin's Quarry, Costelloe, Connemara,	Co. Galway, Ireland. The specimen shows the initial octohedral growth with its corners tipped by cubes modified by the dodecahedron. from the new Diana Maria Mine, Frosterley, Weardale,Co. Durham, England. Liroconite from Wheal Gorland, St. Day United Mines, Gwennap, Cornwall, England. from Wheal Kitty, St Agnes, St. Agnes District, Cornwall, England. Majuba Hill Mine, Antelope District, Pershing County, Nevada, USA. Potrerillos Mine, Potrerillos, Diego de Almagro, Chañaral Province, Atacama Region, Chile. from Styrian Erzberg, Eisenerz, Styria, Austria. from Príbram,	Central Bohemia, Czech Republic. Baia Mare (Nagybánya), Maramureș County, Romania. St. Andreasberg, Harz, Lower Saxony, Germany. 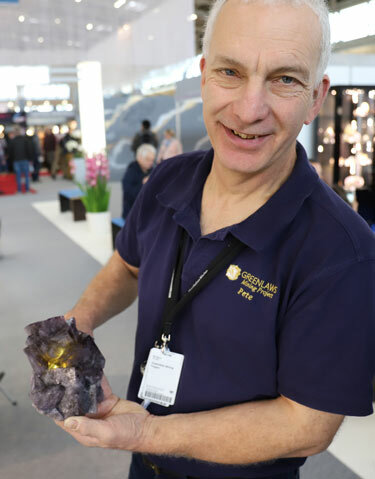 Rob Sielecki of Ausrox shared a showcase of his minerals within the Crystal Classics booth. Some of the fine opal specimens on display in Rob's showcase. also on display in Rob's selection. - this year the creatures were all marine animals. More details of the giant turtle. Each year at Munich there are always attractions for visitors to see as well as all the Mineral specimen dealers. The main exhibition of exceptional specimens this year was as enticing as always. Entitled "Masterpiece Mines, From Mine to Mine" the exhibition covered anumber of the most famous localities for minerals worldwide. here are just a few of he items that were on display. Sweet Home Mine, Alma District, Park Co., Colorado, USA. Himmelsfürst Mine, Freiberg District, Erzgebirge, Saxony, Germany. Wagholi Quarries, Pune District, Maharashtra, India. from Mt. Xuebaoding, Pingwu County, Mianyang Prefecture, Sichuan Province, China. and others from various parts of the world. A facetted example of the Bicoloured Topaz from the Ukraine. Valere berlage usually has some nice examples of minerals from the Congo. Here are one or two. Valere showing us one of his fine Malachite specimens from the Congo. A closer look at that Fluorite specimen. Well that's it for another of the Munich shows. As ever we cannot show all that the show has to offer, there is just so much to see and hopefully some of what has been put into this report will encourarge those that have never been to the show to come and see it for the first time. 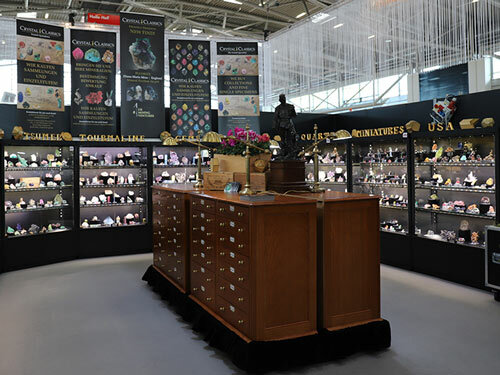 It is without doubt Europe's premier show and gives an insight to all that is the mineral, gemstone and fossil world. Munich 2017 was a great event and it was so nice to see so many of our friends again. We hope to see all of you again this time next year for Munich 2018 and some of you perhaps sooner.